At Co-Optimus, we often lean on developers to add players to the main campaigns of their games. But not everyone can be a Bungie Studios or a Ruffian Games and create an atmosphere that befits multiple players. What's worse is that when developers like Epic Games and EA Vancouver come along and feature two-player co-op, they can be panned for using tactics like splitting up the players or making the enemies too easy. 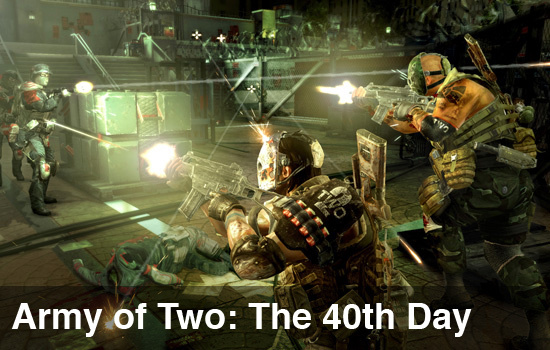 My first Army of Two: The 40th Day experience with the retail version was a straight run-through of the story mode, using an AI partner. It only took me about five hours on Normal difficulty. I was impressed with both the enemies and my AI partner - I was never especially frustrated. 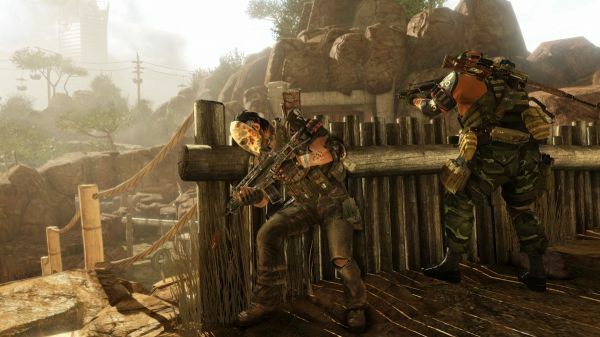 Snipers and special characters will appear in the same places, but for the most part enemy tactics and actions were fluid and changed according to where you were holed up and how you were using the Aggro system. Speaking of which: Aggro returns in full form, but isn't overbearing. By this I mean that accumulating Aggro will not necessarily pull 100% of the enemies' attention to yourself. Your partner will still have to move and attack with a degree of stealthiness, or risk getting blindsided. In effect, the Aggro system assists you - rather than becoming a central method of play - and it leaves you to experiment with different gun configurations and paths through the levels. The Aggro meter acts kind of like a rear-view mirror, something that you glance at occasionally for a quick assessment. Page created in 0.3070 seconds.